Every culture has its differences, but many would be willing to look past them when they get together for a round of drinks—though as it turns out, people have amusingly contrasting views about alcohol. 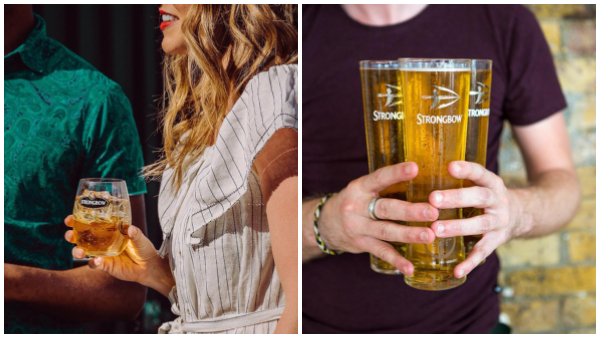 Twitter is toasting to a post shared by user Jasmine Scott that acknowledges the different advertising strategies used by cider brand Strongbow’s US and UK arms. As it appears, Strongbow—or cider in general—is associated with poshness and socializing in the US, and is hence poured into small glasses for sharing. In the UK, however, cider is perhaps more of a commodity than anything, and single drinkers might be able to down pints of it in one sitting. Would you raise a glass to the accuracy of these images? I was shocked when I learned that in the US, if they go out for a beer after work, they mean it literally. The best part is that the UK guy is probably just getting in a quick round for himself before his mates turn up and they really start drinking! Superb! UK version: Let’s get bladdered on Cider! US version: Cider is such a cool drink!